Did you know that you can delete any specific Safari history item from the web browsers history stored on a Mac? While many Mac Safari users likely already know they can clear Safari history for the past hour, day, two days, or clear all history from the browser, far fewer users know that it’s possible to selectively delete specific browser history items from Safari on the Mac. The ability to delete specific items and history from Safari History is fairly easy, and is largely version agnostic, so as long as the Mac is vaguely new and running anything other than an ultra antiquated version of software, the version of Safari and Mac OS or Mac OS X should support specific history removal. Do note deleting an item from Safari history on the Mac is permanent, at least until that site(s) or webpage(s) have either been visited again, or unless a backup of the Mac has been restored to the computer. You can not undo removal of Safari history items. You can delete any individual search history from Safari this way. 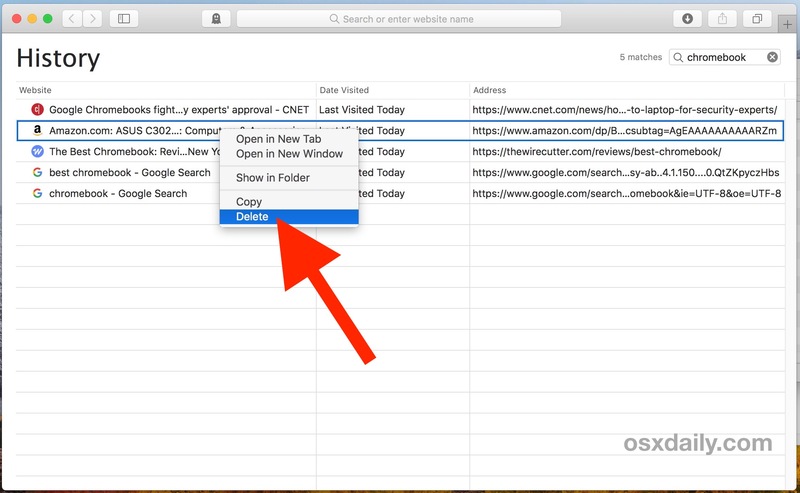 This tip is particularly useful when combined with the Safari History Search feature, since you can find specific keywords, terms, webpages, websites, and topics within History if you want to selectively delete the history within the browser for any found occurrences. You can also go for the drastic option of clearing all web history data in Safari from the Mac, though obviously wiping everything clean isn’t going to be targeted in the same way that deleting particular items from Safari History would be. If you find yourself frequently wanting to delete specific Safari history items, you may be better off preemptively using Private Browsing mode in Safari for Mac, which does not leave any browser history when active. It’s worth mentioning that whether you delete Safari history or use private browsing mode or not, your browsing sessions are not going to be truly anonymous or private because of the nature of how browsers, DNS, ISPs, and the internet in general work. While removing local history will remove traces of a website visit from a particular computer and perhaps hide the visit from yourself or another person, that local data removal has no impact on the various remote servers or the underlying infrastructure used to access websites or the internet in the first place, which separately will track all internet data like website visits and browsing sessions (and they may sell that data too). If you do want to attempt a more anonymized web browsing experience, you’d need to turn to anonymous web browsing apps like TOR or a privacy-conscious VPN service, though even those are not infallible nor perfect. As usual, iOS users are not left out either, as you can delete specific history items from Safari on iPhone and iPad too using a similar method. And it’s worth mentioning these browser history tricks apply to most other browsers like Chrome and Firefox too, though we’re obviously focused on Safari here. This stuff, even with a step by step guide is way too complicated for me! and if it’s to much, just delete all in Settings.